During the holidays, I'll admit, I'm like anyone else when it comes to pigging out. The best part about the holidays is the excuse to eat and drink it up with friends and family, and just spend quality time together. Then there's the load of chocolate and tasty treats that you give and get as gifts, which makes it tough sometimes to want to eat healthfully. It's almost as if you have to convince or trick yourself into eating your vegetables. I am in looooove with kale. I eat it at least once a day, whether it's in a kale juice, thrown in with a stir fry, or included in a salad. I'll take it just about any which way. 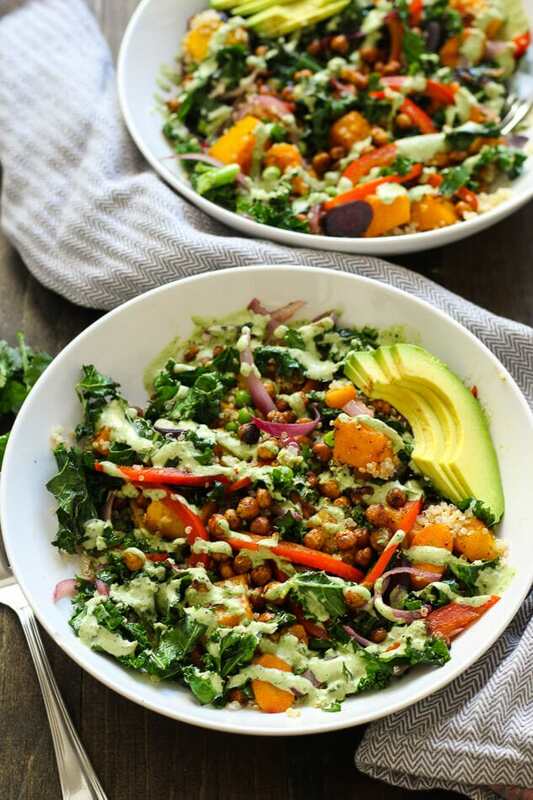 Even if you're not a fan of kale, the savory flavours in this quinoa bowl will have you craving it – trust me when I say kale tastes totally different when roasted with some olive oil and salt & pepper in the oven. Roasted chickpeas are surprisingly so easy to make, and can be made ahead of time if you take 45 minutes on a Sunday to roast them in the oven. I always add a little bit of chili powder and garlic salt for a bit of kick. They make a great snack and a delicious, protein-rich addition to weekday salads. All you need is a can of chickpeas – though you might want to double the portion, they're pretty addictive! Kale and quinoa are both superfoods in that they are healthy, clean foods filled with nutrients, especially the kind that help fight off colds in the wintertime. Anytime I feel myself getting sick, I load myself up with greens, berries, fresh herbs and just about any “superfood” I can get my hands on. Needless to say, this warm vegetable bowl is hearty but nutritiously dense at the same time, and is super filling for a quick weekday lunch. 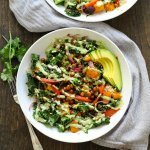 The tahini dressing drizzled overtop of this Kale and Quinoa Bowl is by far one of the tastiest dressings I've ever created. I'm actually not a big fan of dressings since I get sick of the same old salad so quickly. 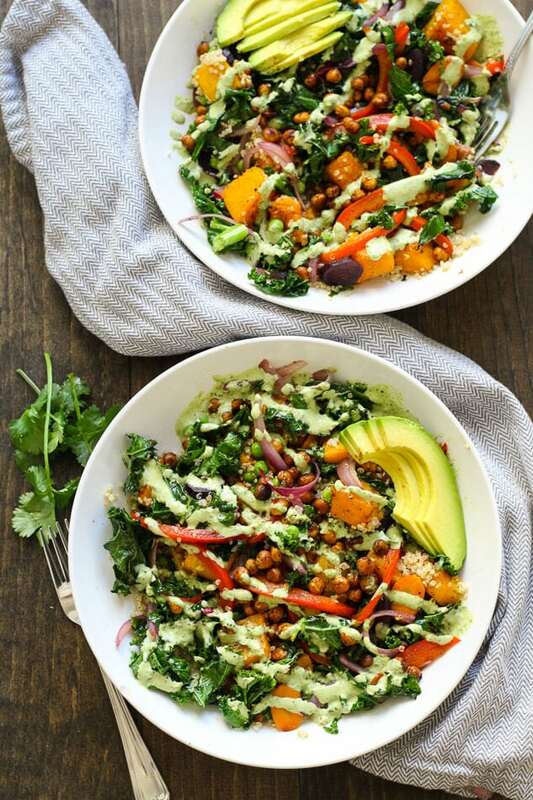 However, the roasted vegetables bring this healthy bowl over the top in flavour, and the tahini dressing finishes it off beautifully. 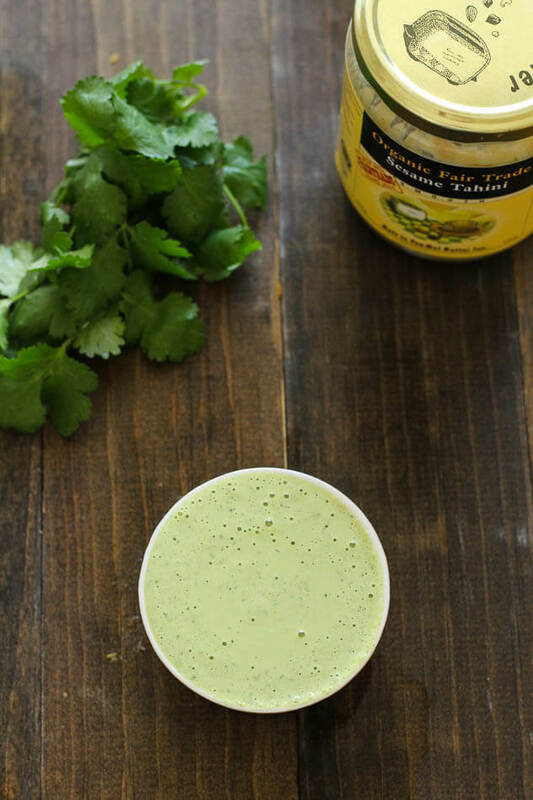 It's as simple as pureeing tahini, water, your favourite herb (I use either parsley or cilantro) and some garlic, salt and pepper! Since we are heading into winter, I chose seasonal vegetables like butternut squash, rainbow carrots, red pepper, curly kale and red onion for this bowl. The avocado was a bonus 😉 I love this recipe because it's super flexible and you can change ingredients by the season. In the summer, I will be trying some grilled fennel, zucchini and a variety of colourful peppers! 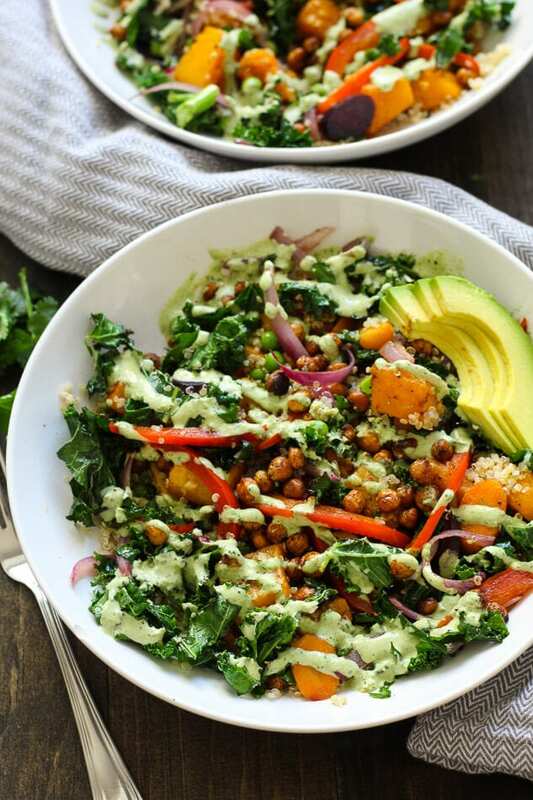 Will you be trying this Tahini Kale and Quinoa Bowl with Roasted Chickpeas recipe? If you do be sure to tag us on Instagram and Twitter – we'd love to see what you come up with!! I like this brand of tahini. 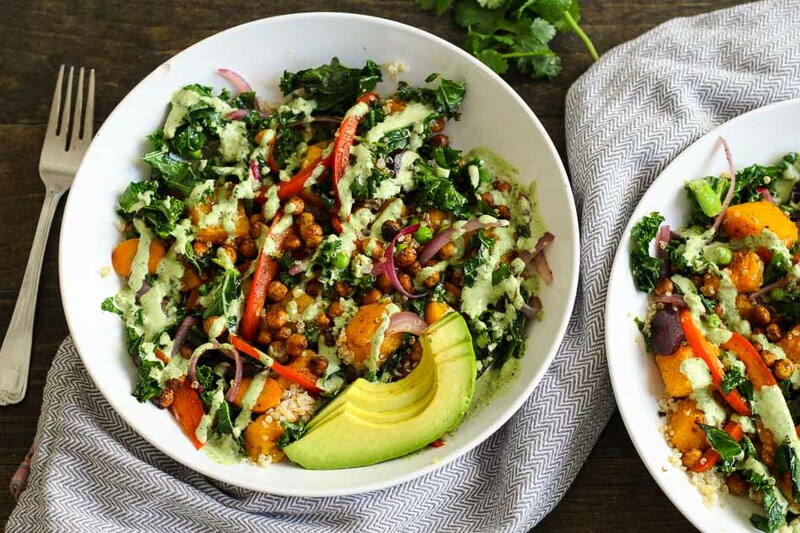 This Kale and Quinoa Bowl has all the fixings, from roasted chickpeas to red pepper, avocado, peas and carrots. 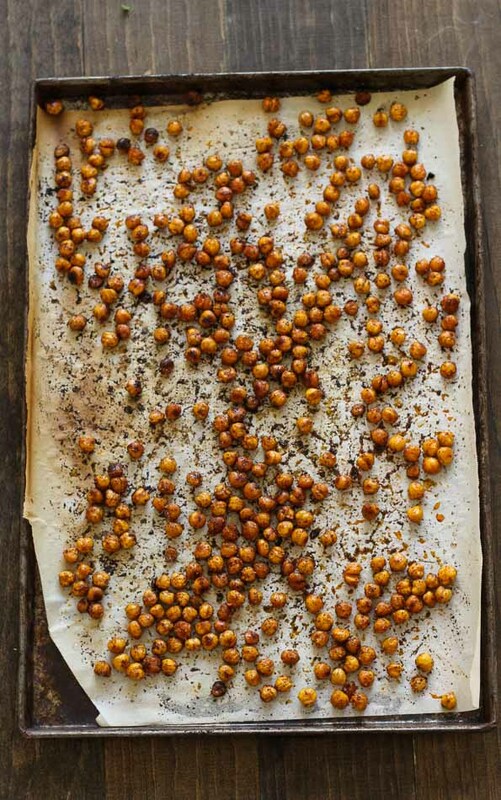 Prepare chickpeas, then cook on parchment-lined baking sheet in oven for about 35-40 min. 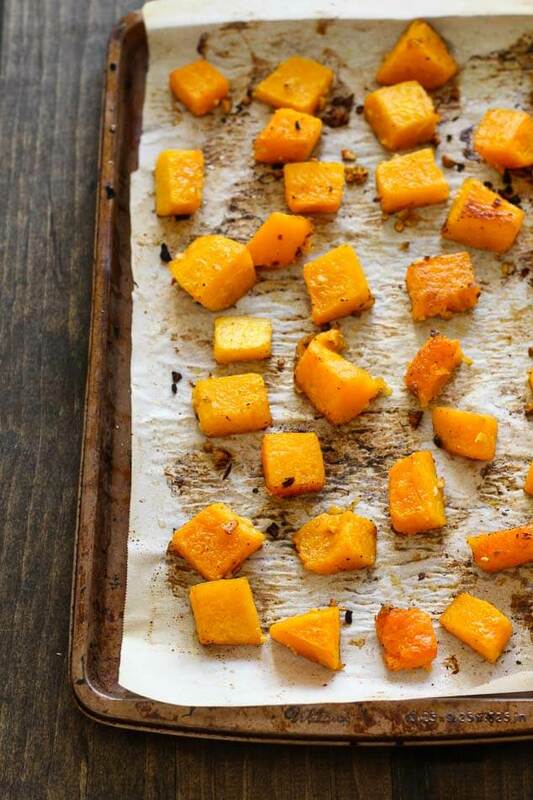 Place butternut squash on a separate baking sheet and cook for about 20 min. Cook quinoa according to package directions (about 10 min). Wash, chop and dry kale. 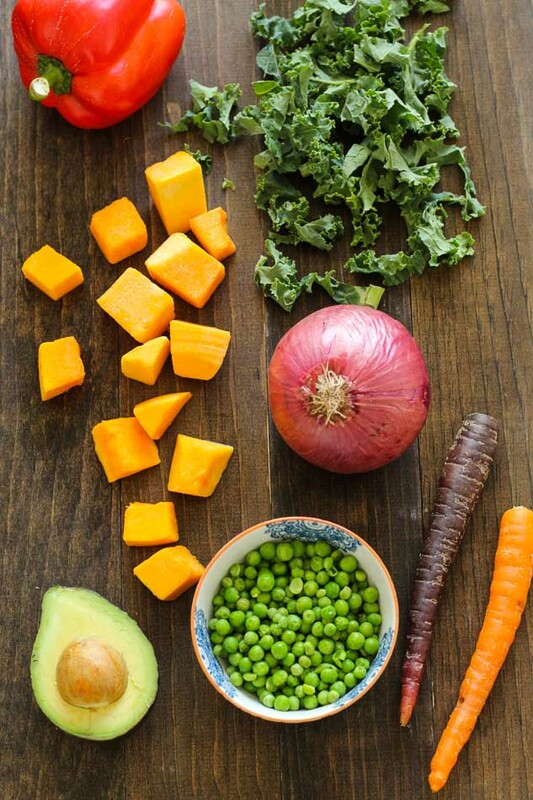 Slice and prepare other desired veggies, then mix with kale, olive oil, garlic and salt and pepper. Spread out on a baking sheet, and cook in the oven until veggies are warmed and roasted, about 7-8 min. In the meantime, make tahini dressing, and line two shallow pasta bowls with quinoa. Top with butternut squash, and additional tray of mixed veggies. Sprinkle fresh herbs overtop, and sliced avocado. Take chickpeas out of the oven, and top each bowl with about 1/2 cup of them. Finish by drizzling tahini dressing overtop of bowls and serve immediately. This looks sooooo good. 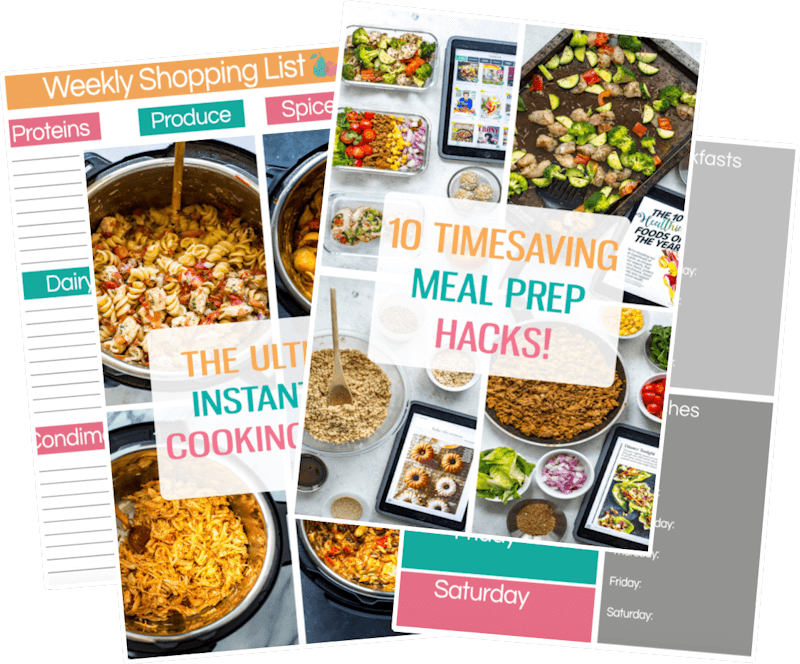 The photos look so fresh and inviting, I feel like I need to make this salad right now! 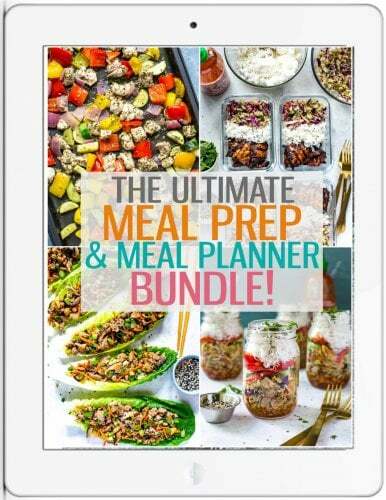 Oh my gosh…I made this the other night and I could eat it every day! It was unbelievably good! I’m definitely pinning this for later! This is like all of my favorite things in one bowl! Thanks Janet!! Will have to pop on over to your blog more often..your gingerbread cookies look delicious! I love chickpeas and roasted veggies in a grain bowl. I put eggplant in mine. Can’t wait to try yours! Always looking for different ways to eat butternut squash! Will this last in the fridge if I prep 5 of them for work lunches? Made your dish for my daughter and her coworker. They LOVED it. Making it again as we speak. Thanks for sharing.